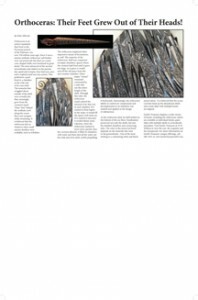 Orthoceras: Their Feet Grew Out of Their Heads! Orthoceras is an extinct nautaloid that lived in the Devonian period of the Paleozoic era, over 350 million years ago. Since it was a marine mollusk, orthoceras’ soft bodies were not preserved, but their ice cream cone-shaped shells were fossilized in great detail. The most advanced of the ancient invertebrates and relative to the present day squid and octopus, they had eyes, jaws and a sophisticated nervous system. This prehistoric squid lived in a chamber at the wide end of its cone shell. The tentacles that wriggled about outside of the shell were actually feet that, amazingly, grew from the creature’s head! These “feet” helped the mollusk crawl along the ocean floor and navigate while swimming. It is believed that the orthoceras fed on whatever other small marine dwellers were available, such as trilobites. The orthoceras employed other impressive means of locomotion, as well. The majority of the orthoceras’ shell was comprised of empty chambers, spaces where the creature had lived until it grew too large. As it grew, it would seal off the old space from the new roomier chamber. These empty “rooms” remained connected by a tube that ran the entire length of the shell. Through this tube, the orthoceras could control the amount of air that was in each chamber. If it wanted to float higher in the water, it would fill the spaces with more air. If it wanted to descend, it would release some. Likewise, when the orthoceras wanted to move more quickly than the currents allowed, it filled its chambers with water and then shot all the water out the wide end of its shell, swiftly propelling it backwards. Interestingly, the orthoceras’ ability to control air compression and decompression in its chambers was studied and applied in the design of submarines. As the orthoceras died, its shell settled on the bottom of the sea floor. Fossilization preserved not only the shells, but also the detailed chambers and connecting tube. The color of the preserved fossil depends on the minerals that were in the groundwater. One of the most striking is a contrasting white and black preservation. It is believed that the ocean currents lined up the abandoned shells since most slabs with multiple fossils are aligned.